This Report on Community Service Program of Jack and Jill of America is about the projects of Jac and Jill and specially discussed its program about Jeans For Teens. 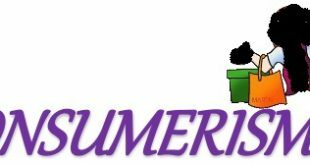 Jack and Jill of America, Inc. is a membership organization of mothers with children ages 2-19, dedicated to nurturing future African American leaders by strengthening children through leadership development, volunteer service, philanthropic giving and civic duty. The late Marion Stubbs Thomas founded Jack and Jill of America, Incorporated on January 24, 1938 in Philadelphia, Pennsylvania under the laws of the state of Delaware. Twenty mothers came together to discuss creating an organization to provide social, cultural & educational opportunities for youth between the ages of two and nineteen. In 1946, ten chapters were involved in the national restructuring process. The Thompson quintuplets were born May 8, 1997 and are the beneficiaries of a National Service Project since 1998. Jack and Jill of America made the commitment to assist the children until they are adults. 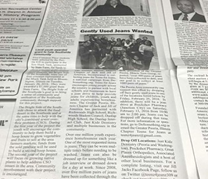 The family resides in Washington, D.C. With the financial support of Jack and Jill of America, Inc. and the Jack and Jill of America Foundation the quintuplets continue to benefit from the compassionate service and relationship with Jack and Jill of America, Inc. The National Program Director serves as the Liaison to the Thompson Family. Community service is the hallmark of a servant leader and is the underpinning of the Jack and Jill of America philosophy of leadership development. For this reason, Jack and Jill youth across the country that completes at least 25 hours of community service receive certificates of recognition. Jack and Jill is also proud to have established a National Day of Service held each January to make a difference in the community. In addition, regional community service projects under the leadership of the Member-at-Large (MAL) elected officers for each region are held in conjunction with seven regional Teen Leadership Conferences held each year. The National Program Director serves as the Liaison to the MALs. Jack and Jill of America will continue to be an organization that serves the community through its efforts and that of the Jack and Jill of America Foundation. Likewise, we will continue to train our children to be servant leaders. Jack and Jill of America have long recognized that in order to maintain a level playing field, it is critical that we have the freedom to speak in support or opposition of policies/practices, especially those that do not seem to yield fair and equitable outcomes and having a disproportionate impact on any segment of the population. Under the leadership of the National President and National Legislative Committee, Jack and Jill organized the first “On The Hill Summit” in Washington DC in 2009. In 2010, Jack and Jill launched the first ever Jack and Jill Day at the State Capitol initiative across the country. With one voice, mothers of Jack and Jill of America will continue to let our voices be heard on behalf of children through an active legislative advocacy agenda. The organization has initiated Jeans for the Teens Program in order o help the underprivileged and under dressed families. 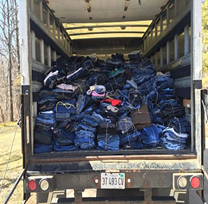 In this program, We collected 2674 pairs of jeans from various facilities around the area. Two sister schools Dunlap and Richwood’s approached the problem. Dunlap is in a wealthier area. They worked with an Interact Club and collected jeans for 1 week. The other school Richwood’s had boxes in the school but had to rely mainly on nearby businesses. The teens created a ” business ” like a model with the assembly of boxes and careful placement to strategize success. They had an advertising team that focused on Social Media as well as various TV/radio spots. The engineering team tracked data. The customer service team told drivers where to go for pickups and was the liaison. We decided to do Teens for Jeans because we felt that it was different. Also, we felt that Teens for Jeans would give us control over the project opposed to committing to a project that had already been set up. We came together and decided which businesses we would ask for permission to place our boxes. We formulated a plan on how we would collect the jeans and spread our campaign. We collaborated with Act II who provided assistance with the entire campaign. In addition, we united with Dunlap High School’s Interact Club and Richwoods High School’s student council. We wrote request letters to our schools–Richwoods High School, Dunlap High School, Dunlap Middle School, St. Thomas Elementary School– and local businesses. After sending letters of permission, we talked to the principals of the various schools explaining our plan and we asked teachers at the various schools if he/she would sponsor our campaign. We went to U Haul for boxes, various stores around Peoria for scissors and tape, and FedEx print shop to print flyers. After we had the sufficient supplies we constructed and decorated the collection boxes. Once the boxes were constructed and decorated, we put the boxes in various businesses around Peoria. We assigned a liaison to each box that would tell us when the box was full. We split into four committees with different responsibilities. The committees were: Engineering to manage spreadsheets; Journalism to write scripts for interviews, write press release forms, and write thank your letters; Advertising to inform population on Teens for Jeans and update followers on jean drive dates and signs of progress in the jean drive; Driving: stay in contact with liaisons and pick up jeans when the collection boxes were full. We got onto social media and spread the word on our mission and encouraged people to donate their gently used jeans. We also put up flyers around our school which encouraged students to donate to our cause. 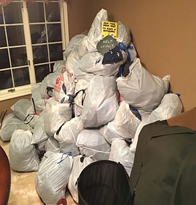 In addition, we scheduled TV and radio interviews which spread the word around our community about “Teens for Jeans” and informed the population of the location of collection boxes and upcoming jean drives. When the liaison told us that the boxes were full, we had our drivers pick up the jeans and drive them to a central location. Here, the jeans would be counted and the amount of jeans collected would be entered into a document. Also, we had two jeans drives–one at Pink Sugar and one at Preckshot Pharmacy– where members collected jeans and informed passers-by on our cause. After 2 months of hard work, we sent off all 2,674 jeans to Peoria Rescue Ministries, a local homeless shelter. 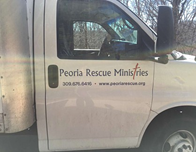 Peoria Rescue Ministries then distributed the jeans to other homeless shelters around Peoria such as the Dream Center and Southside Mission. In addition, some of the homeless shelters sold the extra jeans for money to buy food. Some funds were used to help with operating costs of the shelters. After the campaign was over we took the collection boxes out of the businesses and put them in storage for future use. We wrote thank you letters to the businesses around Peoria and informally thanked teachers, principals, and students for their participation in the Teens for Jeans campaign. After the jean drive was over we weighed in on the positives and negatives. We felt that Teens for Jeans was extremely successful despite it being the first time that we did it. However, we did agree that if we were to do the project again we would start the project earlier, we would inform local students more directly about our cause and we would attempt new tactics in order to improve participation in the jean drive. The project would help the local community through the volunteers and community service hours. The project was flexible with teens busy schedule, as shown in the graph below, the volunteer hours varied based on the weeks of the project. The volunteers have contributed flexible hours according to their availability to the project. Teens decided to do this project with Dunlap to work together even though we went to different schools; came together for a greater cause. The project has potential to incorporate talents the teens had, as 55% of the total participants of the project were teens, who have utilized their talent and fresh mind and energies to make it a successful project. The project was an inexpensive yet advantageous project, as shown in graph below. The total expense for the project was only $124. The project can be undertaken each year on annual basis. 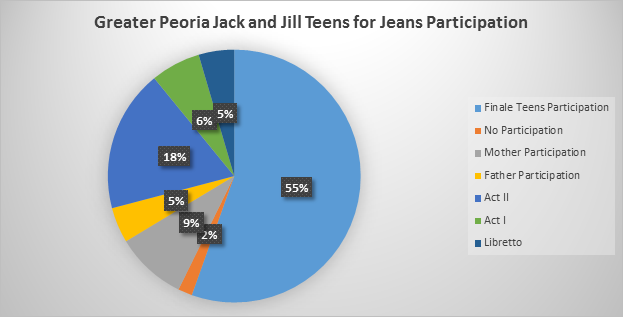 The average cost of jeans: $34 (Business Times, 2016) and a total of 2674 jeans of worth $90,916 were collected and utilized to provide clothing to Peoria residents who, otherwise, would not be able to afford jeans. By donating to teens lacking clothes, they now are able to feel some self-esteem that was once inevitable.